Lest you're holding on to any belief that big ISPs like Time Warner and AT&T care the least bit about making available the best technology at a fair price, just look at the situation in Austin, Texas, and Kansas City to learn otherwise. Before the threat of Google Fiber arrived, broadband in those places was as slow and expensive as it is everywhere else. When Google Fiber launched in Kansas City, Time Warner Cable announced it will increase its fastest service to 100 megabits per second (mbps) in KC, and says it'll match anything Google rolls out in Austin. When Google announced plans for gigabit-fast fiber broadband service in Austin, AT&T immediately spelled out plans to offer fiber-based gigabit-per-second broadband service there. All of a sudden, Google Fiber isn't the only superfast service in town. Now, Google has to compete against two big incumbents also promising really fast broadband in Austin and KC. This, after Google pledged to spend many millions to bury fiber optic cables in those cities. That makes Google sad, right? Not necessarily, says cable industry analyst Craig Moffett in an October 25 investor brief. Moffett suggests that Google may have known all along that incumbent ISPs would be forced to match Google's gigabit broadband offer. For months and months all the analysts and tech pundits seemed to focus solely on the question of whether or not Google's fiber Internet and TV services could actually make a profit. Moffett is the first analyst I've read who suggests that Google's real intent may be to create competitive and regulatory environments in which other ISPs can sell gigabit-fast Internet. Here's Moffett on Google's plans in an October 25 investor brief: "Their goal--or, their Plan A, at least--appears to be nothing less than to ensure that there are at least two high-capacity broadband networks in every market." "It would be absurd to suggest that they plan to overbuild the whole country themselves (although we have heard some suggest precisely this). Instead, it seems clear that they are hoping to show the way for others by demonstrating that a fiber overbuild can indeed be profitable." 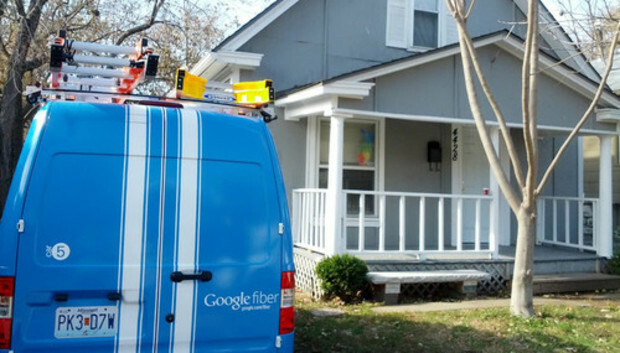 Both Google's and AT&T's gigabit services are set to debut in Austin mid-2014, although AT&T says it'll begin selling a 300-mbps service in the interim, in December. So Google may lose money in the short term on its fiber business, but if it can lure, force, or entice other ISPs to sell dramatically faster broadband across the country, it would effectively be giving all its other services superpowers. Google's core business is selling ads targeted to consumers based on the keywords used in free services like search, email, social networking, and streaming video. Precicely targeted ads backed by the power of Google's Big Data infrastructure, running on Google's insanely popular services. If those services run faster, better, and reach more people, Google benefits. The advent of gigabit-fast broadband might also open the door to a whole new generation of Google services, which might fully exploit and rely on really fast speeds. It wouldn't be the first time Google has jumped into a new technology space to raise the level of play for all the players there. When Google wanted to influence the smartphone market to produce the kind of smartphones that would showcase its Android operating system, it decided to make a phone--the Nexus One. The phone, which was manufactured by HTC and released in January 2010, was the first in a series of Nexus phones designed by Google and manufactured by partner phone makers. Google did the same thing with tablets, working with Asus on the Nexus 7 tablet, which became the 7-inch Android tablet against which all others were measured. It has sold very well--around 7 million so far. Moffett also suggests in the brief that even if Google doesn't force more fiber broadband providers into the market for competitive reasons, it might at least bring about a regulatory environment that's more favorable to would-be fiber ISPs. In Austin, AT&T said it would only launch a fiber service if it could get the same sweet regulatory deal that Google got. Namely, Moffett says, Google was granted permission to plant its fiber in neighborhoods where the residents can afford $150 a month cable bills. This made the idea of digging trenches and dropping fiber sound like a little less of a headache to AT&T. An AT&T spokesperson told me that she couldn't comment on the regulatory picture or on the timing of AT&T's foray into fiber broadband, but said Austin was a good place for it. "In Austin we have some lab facilities, we develop a lot of our research features there, and with the universities there, and with South by Southwest, it's definitely a big tech town," she said. "Austin is just the first city where we're doing this, but it definitely won't be the last, she added. Today, before the fiber services launch, Austinites have become accustomed to mediocre broadband service at premium prices. Just like everybody else in the United States. In Central Austin's 78704 area code, AT&T's fastest broadband tier available today runs at "up to 24 mbps" and costs $66 per month. How close, and how consistently, the service comes to that top speed depends on how far you live from the fiber node in your neighborhood. That node is served by fiber optic cable, but connects to your house via a standard copper phone line. Time Warner Cable's fastest tier in the same neighborhood is $75 per month for 50 mbps. The company gets one and half stars out of five at its Yelp page for Austin. One Yelper comments: "I could have invented the Internet in the time I have spent on hold with Time Warner Cable." Austin and Kansas City residents are the lucky few who get to see relief from the effects of our woefully under-competitive broadband market in the United States. Only after the threat of Google Fiber arrived did broadband service in those cities improve--quickly and radically. While federal regulators have--for years--helped cable and telephone companies wipe away competition in the broadband market, city regulators in Austin decided that some real competition might be a good thing. For now, the rest of us will be stuck with painfully expensive monthly bills and service that's often unreliable, and often doesn't deliver the speeds promised. Hopefully, Google's fiber gambit will have the same effect in other markets as it's having in Kansas City and Austin. Maybe, if we're lucky, entrenched Internet providers will start offering fast and affordable fiber services in cities before Google announces an invasion, in an attempt to preempt it. Either way, when we all get Internet service 50 times faster than we have today, Google wins.